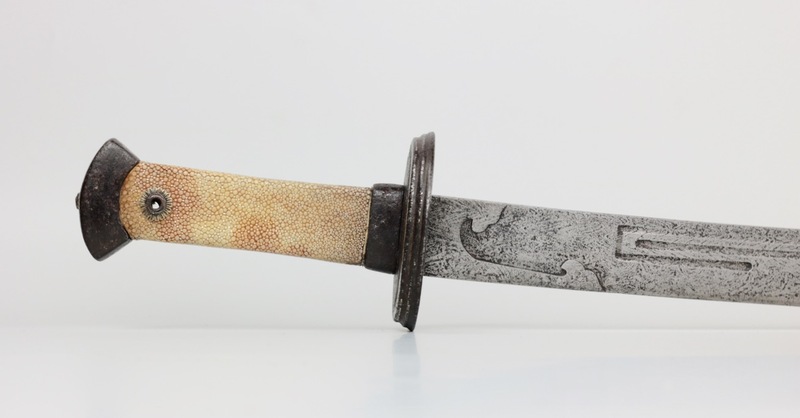 Most Chinese sword blades were made with a high-carbon steel plate exposed at the cutting edges. The high carbon content allowed this plate to be hardened to take and hold a very sharp edge, but also made it brittle and prone for snapping. 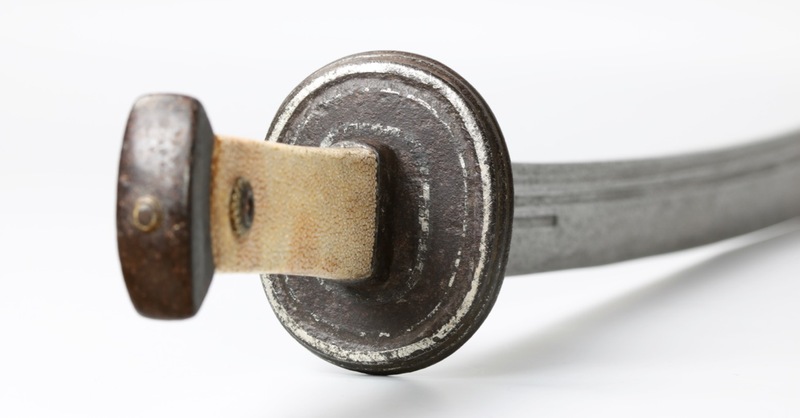 To protect this brittle core that is so vital to a sword's functionality, it was supported on either side with a laminate construction or milder iron and steel. These different layers were forge folded together to create a tough structure. 1. See: Philip M. W. Tom: Some Notable Sabers of the Qing Dynasty at The Metropolitan Museum of Art Metropolitan Museum Journal, v. 36 (2001). 1. Also known as 佩刀 peidao after the 皇朝禮器圖式 (Huangchao Liqi Tushi) of 1766. This is a set of Qing regulations that uses nonstandard language for many weapons, choosing names often from ancient Chinese writings. 2. See Elliot, Mark C., "The Manchu Way", Stanford University Press, 2001. 3. Tom, Philip M. W., “Some Notable Sabers of the Qing Dynasty at the Metropolitan Museum of Art”, Metropolitan Museum Journal, Vol. 36, 2001. Blade thickness: forte 7 mm, middle 6 mm, at backedge 4mm, near tip 3mm. Point of balance: 16 cm from guard. Materials: Iron, steel, silver, wood, brass, ray-skin. 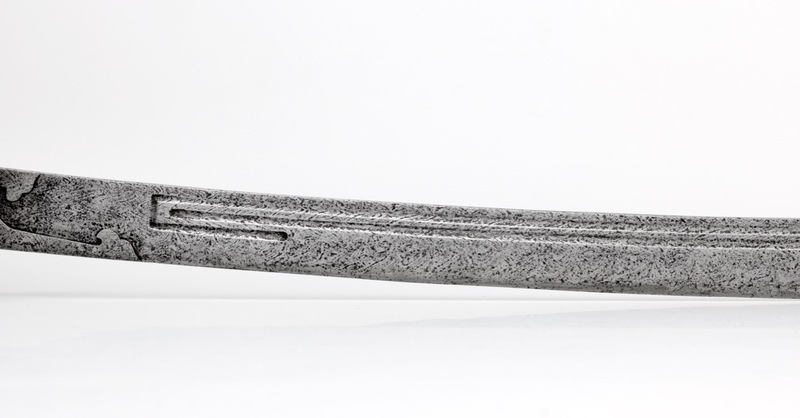 A Chinese saber of early liuyedao form, probably dating to the late 17th or early 18th century. 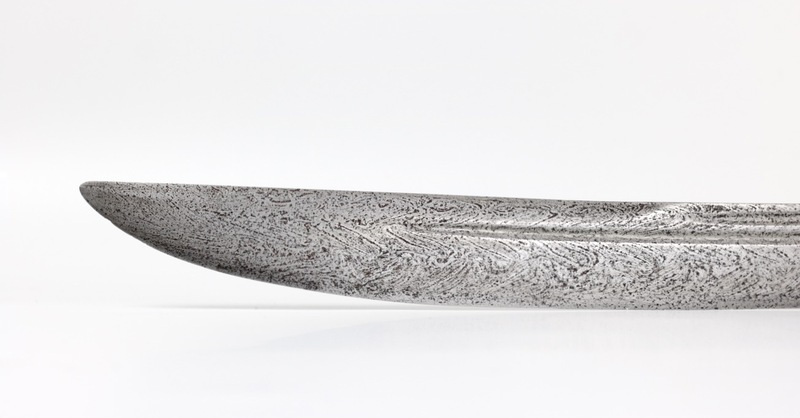 The blade with U-turn grooves inspired by Mughal swords with the same feature, and a false backedge. 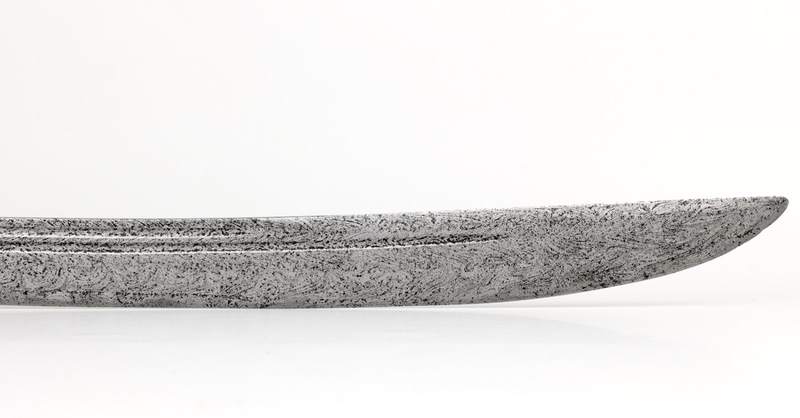 It has a tunkou (collar piece) that is not made of a separate part of metal -as is usually the case- but is chiseled out of the base of the blade. Quality of the chiseling is superb. 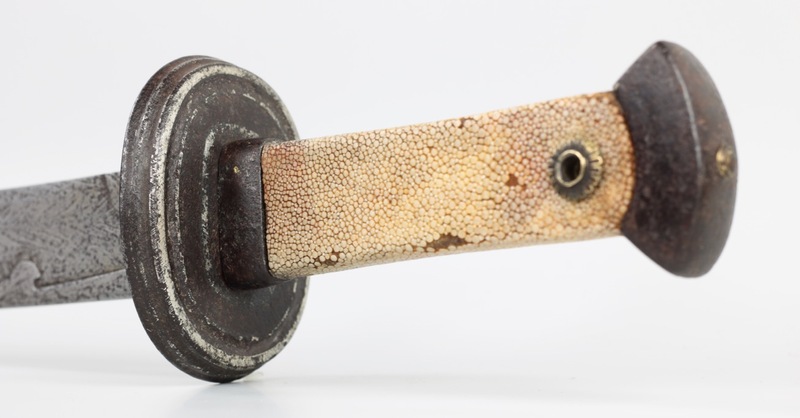 Both the U-turn groove and chiseled tunkou are fairly rare and desirable features in Chinese sabers. 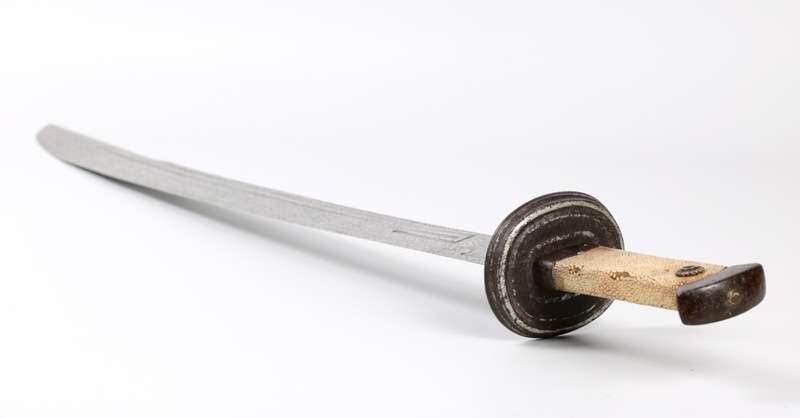 The blade is of four row twist-core showing incredible control by the smith: The rows of rosettes are of equal size and in straight lines, following the lines of the grooves and contours of the blade. The pattern was originally etched in mild relief, which can still be felt today. 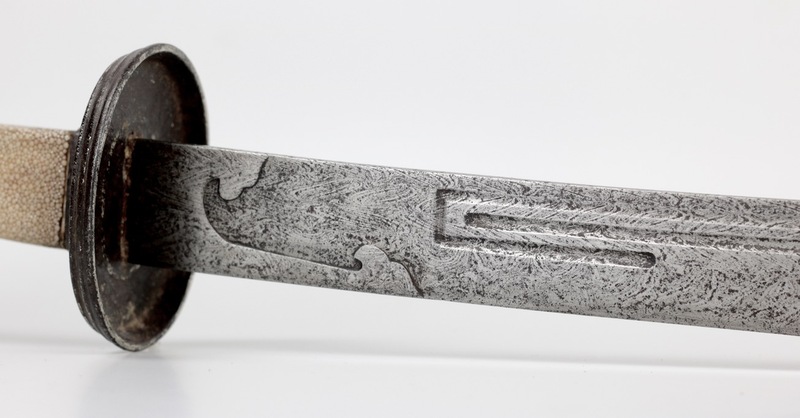 The hilt fitted in very early style mountings that came with the blade, they have probably been with the piece for a long time. 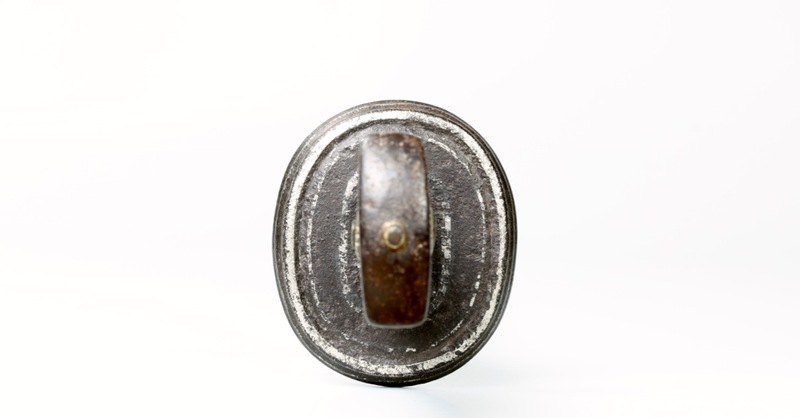 The guard is a thick, round cup guard with silver damascened decor of rings and a stepped side. 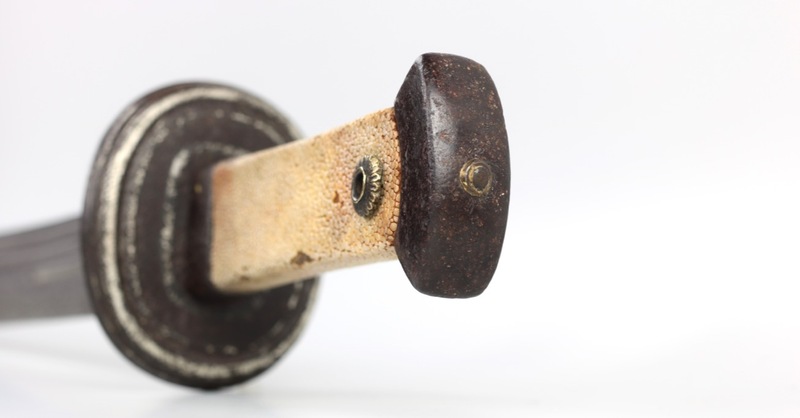 Ferrule and pommel are of a slightly rounded version of the early angular style. The fittings exhibit an elegant simplicity that reminds of Ming furniture. It is fairly heavy for the size, with good handling characteristics. It's not just a parade showpiece, but a hefty saber with a good feel in hand. Early Chinese luiyedao saber with twist-core / hairpin forged blade. Chinese yanchidao saber with twist-core / hairpin forged blade. Blade in excellent condition, retaining all of its original contours and bevels. No nicks, cracks or over-polishing. 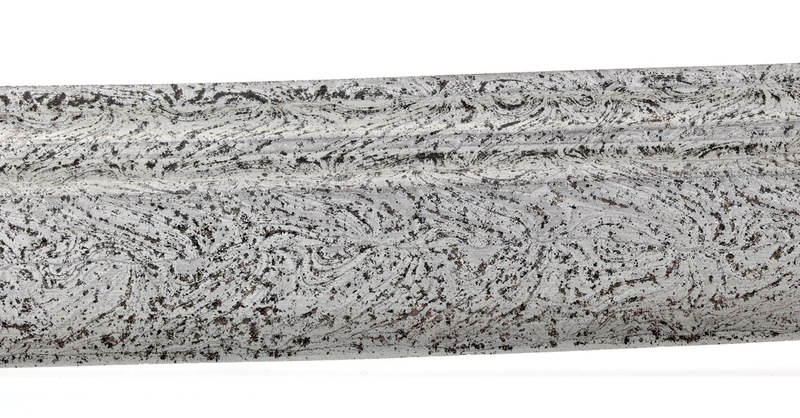 Renewed handle, covered with distressed ray-skin. 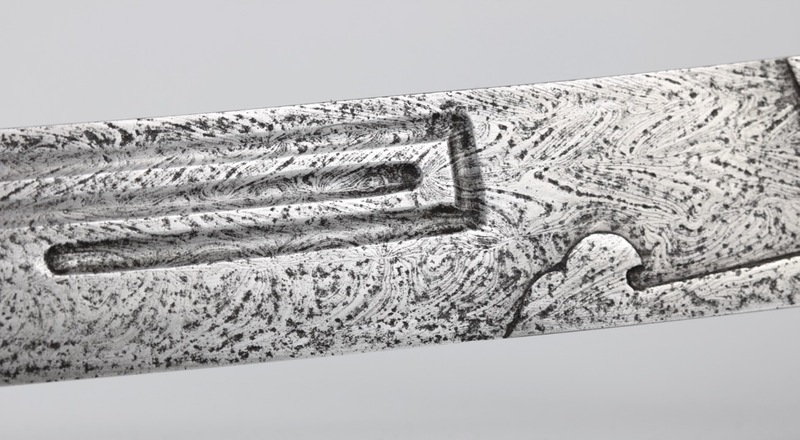 Comes in a new resting scabbard. 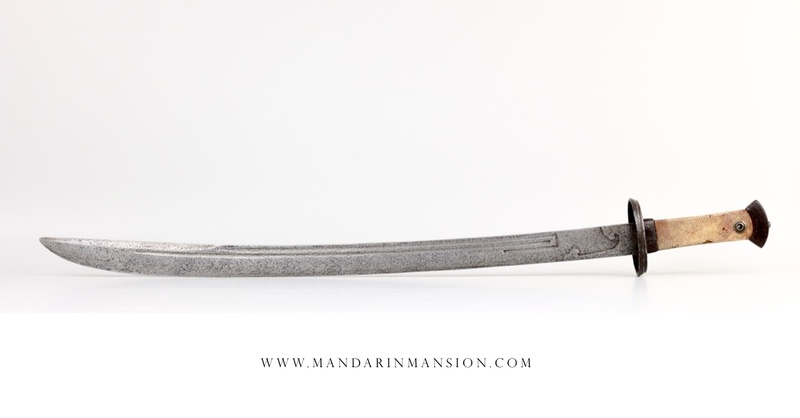 A rare Chinese saber with a blade of the highly sought-after huawengang , exhibiting a high level of control. The blade further features U-turn grooves and a very precisely chiseled tunkou . A good, solid piece with some very interesting features, in great condition.